The Find It® Kids hidden object game is a brightly colored, educational, Contained Adventure™. It contains 48 hidden items for you to find, conveniently listed on the top of the game. The items found in this sealed container are geared toward kids. SPIN IT, TWIST IT, SHAKE IT! Be the first to find the hidden penny, marble, balloon, or letters of the alphabet, and so much more! This family game is enjoyed by adults as well as children. It is a great travel game, terrific learning center activity, or is fun played as a timed game with others. 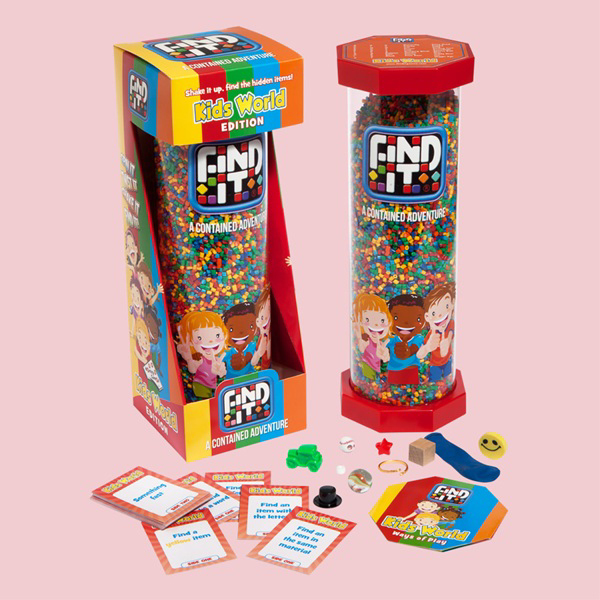 The Kids version comes with red plastic ends, giving the game an exciting, colorful look and caters towards learning. Skills used: deductive reasoning, object identification, early reading/ letter recognition, as well as patience. The package includes the Find It® Kids hidden object game, playing cards and Ways to Play sheet. An educational family game for one or more players to enjoy whether you are 8 or 98!